2018 5th Annual "ASIA SUPER TEAM: Dare for Future"
The brand new "ASIA SUPER TEAM: Dare for future" has invited three of the brightest stars from Taiwan, who have been shining on the international stage. This time, they and their team will be sharing their experience and thoughts on their journey from Taiwan out to the rest of the world. Taiwan's unique people and customs, its diverse history and culture, and its wealth of natural resources have given them the strength that supported and helped them to successfully make their way towards greatness. Therefore, they are sending out a call to the companies from countries around Asia to sign up for this year's "ASIA SUPER TEAM: Dare for future," to come together to feel, taste and experience the distinct richness and stories of Taiwan. "The ASIA SUPER TEAM" competition is now in its fifth year and our scope continues to expand. This year, we will be partnering with top companies from a total of eight Asian countries—Japan, Korea, Singapore, Malaysia, Indonesia, Thailand, Vietnam, and the Philippines. These teams will all be embarking on new, exciting journeys in pursuit of their dreams.The competition is divided into two stages. Stage one encompasses the selection of online applicants for eight finalist teams (one from each country), while stage two is where the finalist teams come to Taiwan for the Finals Tour. During the process of the competition, contestants will learn about Taiwan's multitude of scenic locations, cultures, and unique city features, as well as experience a form of corporate meeting and incentive travel like they've never previously encountered. The company selected as the ASIA SUPER TEAM champion will be awarded a Taiwan reward travel package valued at US$50,000. 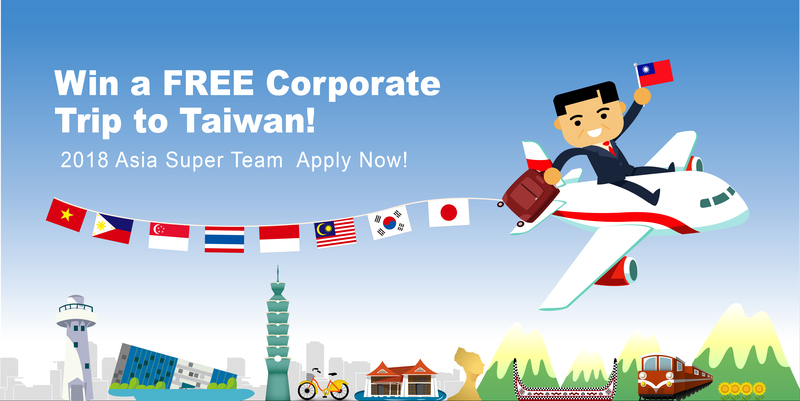 So register now for a chance to join your coworkers on an incentive tour to Taiwan, strengthening your team unity and rapport, as you embark on the pursuit of your dreams and visions. In 2014, MEET TAIWAN launched its first multinational competition event. Called ASIA SUPER TEAM, companies from overseas were invited to participate in interactive online and live competitions to experience the diverse resources and facets of Taiwan's MICE environment. The ASIA SUPER TEAM event completely overturned business travelers' impressions of corporate meeting and travel incentive activities in Taiwan. Furthermore, the competition created a new model of B-to-B Marketing. Not only were we named the 2015 Most Effective Incentive Marketing Campaign from the Society for Incentive Travel Excellence (SITE), we were also honored at the "Oscars for Business" with a Stevie Award for B-to-B Marketing Campaign of the Year. In 2015, we continued with our efforts and launched the second ASIA SUPER TEAM: TEAM UP FOR "GOOD" event which incorporated corporate social responsibility and elevated the mission and scope of the competition on all fronts. We invited even more Asian companies to enter this extremely entertaining, deeply meaningful, and highly creative competition. The 2016 3rd Annual ASIA SUPER TEAM: THE ALMIGHTY PLAYER saw the launch of an brand new competition mechanism when we used online interactive games to completely overturn past corporate mentality in a way that stimulated the intellect, flexibility, and creativity of corporate employees to successfully transform the face of corporate meetings and travel incentives through "play". In this two-stage competition, the corporate teams that wish to participate are requested to register for the event first. Selection is then conducted through a professional assessment mechanism; one company from each of the target countries will be given the tickets to come to Taiwan to partake in the competition. The second stage is the four night, five day Final Tour, during which the teams will travel all around Taiwan. They will be given a chance to demonstrate their skills and display their passion for and knowledge on Taiwan incentive travel. The winning team will be awarded a Taiwan reward travel package valued at USD 50,000. The Taiwan Bureau of Foreign Trade (BOFT), Ministry of Economic Affairs implemented the 4-year Taiwan MICE Development Program (2009-2012) and the 4-year MEET TAIWAN initiative (2013-2016). The main goals were to establish an internationally appealing and competitive conference and exhibition environment, create higher industry value, create an international exhibition image of higher caliber, and develop Taiwan into a major hub for the training and cultivation of international conference and exhibition capabilities and talents. The ultimate target was to ensure that organizers of major international conferences, exhibitions, and events chose Taiwan as their venue and destination. Beginning in 2017 for the next four years, MEET TAIWAN will continue to be implemented until 2020. The vision of this project is to "develop Taiwan into a major global hub for conferences and exhibitions". Long-term development goals are to expand Taiwan's MICE industry software and hardware potential, enhance the international visibility of Taiwan's MICE industry, strengthen the industry's international competitiveness, and support Taiwan's industry developments through MICE activities. In addition to continuously accumulating and exerting Taiwan's competitive advantages in the MICE industry, the project furthermore encompasses the marketing of Taiwan's MICE brand—MEET TAIWAN—so as to strengthen public awareness of Taiwan's MICE industry in audiences both domestic and abroad. These efforts will in turn increase the international brand value of Taiwan's MICE industry and ultimately attract more international MICE events and incentive travels to Taiwan.